European Southern Observatory /M. 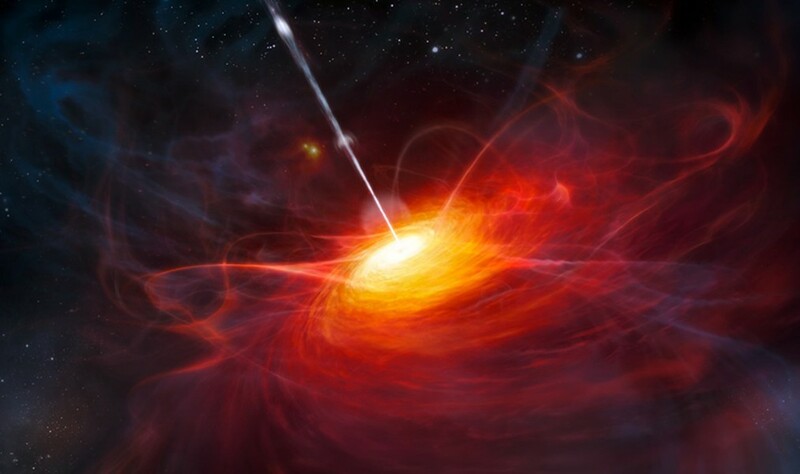 Kornmesser, public domain Artist's impression of the very distant quasar ULAS J1120+0641, with a mass two billion times that of the sun. Quasars like these are now used to test general relativity using radio waves, which can be detected in daylight. Last week, we saw how photographs taken during the total solar eclipse of 1919 were said to confirm Albert Einstein's 1916 "General Relativity" theory of gravity, even though one of the three datasets — which ran counter to Einstein — was discarded. Until other ways of testing General Relativity were devised, few scientists voiced what, in retrospect, is obvious: Measuring the deflection of starlight near the sun during a total eclipse is a terrible way of testing the General Theory of Relativity! It's inexact, it depends on perfect visibility, it can be thrown off by moisture in the atmosphere, refraction and a hundred other variables, and it's subject to interpretation by fallible (and probably biased) humans. Only in the 1970s did radio telescopes easily verify Einstein's prediction for space curvature by measuring the deflection of radio signals (detectable in broad daylight!) from distant quasars. In 1980, historians John Earman and Clark Glymour published a scholarly paper in Historical Studies in the Physical Sciences, in which they took a long, hard look at the events preceding the November 1919 announcement of the expeditions' results. They concluded that Eddington, in his zeal to champion what he called Einstein's "beautiful and profound theory," had fudged the results, tossing the "bad" (counter to Einstein) dataset because it didn't fit his preconceived beliefs. Had these data been used, Earman and Glymour surmised, the conclusion from the 1919 eclipse expeditions would have been much more nuanced, with no clear "winner" in the Newton vs. Einstein "duel in the sun." Subsequently, John Waller's popular science book Einstein's Luck popularized this revisionist history. Waller's title sums up the new thesis: Einstein was lucky. The publicized results from the eclipse could easily have gone the other way, had not Eddington been biased in favor of Einstein. Fortunately for the history of science and Eddington's reputation, not everyone was wholly satisfied with Earman and Glymour's version of the 1919 events. University of Arkansas physicist Daniel Kennefick undertook a re-reinterpretation and concluded that Eddington was not involved in the decision to discount the pro-Newton, anti-Einstein data. The Sobral expedition had been launched by the Greenwich Observatory, and it was there, under the supervision of the skeptical Frank Dyson and independently of Eddington, that the decision was made. The telescope in question had lost focus during the eclipse (probably due to a sharp drop in temperature) resulting in what was (in 1919) an insurmountable scaling problem. One final irony: Kennefick discovered that the problem plates had been reanalyzed, without fanfare, in 1979 using modern computerized astrometric (star-measuring) equipment. Remember how Einstein's theory predicted a 1.75 second displacement for starlight "grazing" the sun, half that of the old Newtonian theory of gravity? Dyson's team at Greenwich had measured a mean shift from the discarded out-of-focus data of 0.93 seconds, favoring Newton. When reanalyzed with modern equipment (which eliminated most sources of error), the shift was an Einstein-compatible 1.55 plus-or-minus 0.34 seconds! In other words, if those doughty astronomers of 1919 had magically been given access to today's tools, they would have seen that all three sets of data unambiguously supported Einstein's model of gravity. Barry Evans (barryevans9@yahoo.com) was originally introduced to Eddington's writings by his aunt, a fellow Quaker.